Stuttgart's city centre is dominated by the City Ring. It is the result of traffic planning in the 50s and 60s, which was focused on car traffic. The car was given a high priority because of the presence of the local car industry. 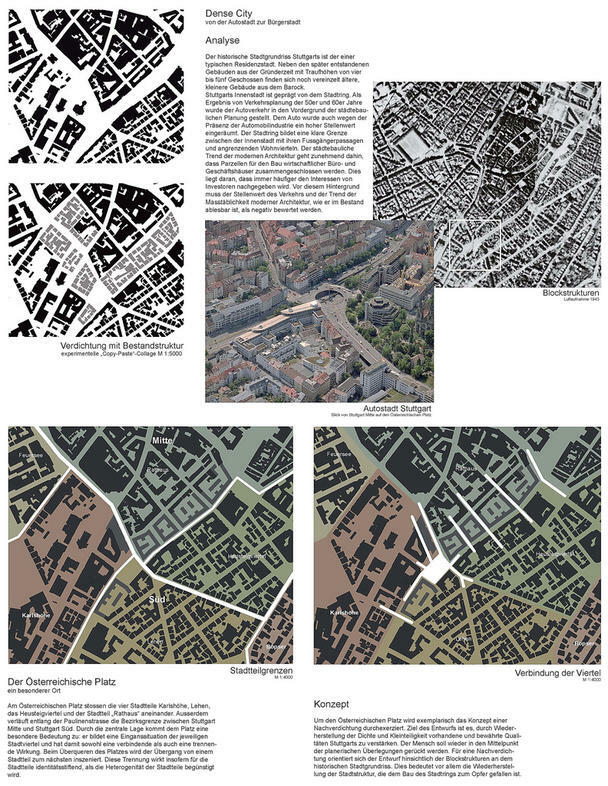 The City Ring constitutes a clear border between the inner city centre with its pedestrian walkways and adjacent residential neighbourhoods. The trend of modern urban development increasingly produced a building typology that merges commercial offices and retailers in a big scale. The city has given in to the interests of investors. Against this background, the status of traffic and the trend in scale of urban design in Stuttgart has to be evaluated negatively. At the Österreichischer Platz the four districts Karlshöhe, Lehen, and the Heusteigviertel the city district "Rathaus" meet. In addition, the Paulinenstrasse runs along the district border between Stuttgart Centre and Stuttgart South. The central location is a place of significance: it constitutes an entry to the respective districts and thus has both a unifying and a divisive effect. While crossing the square the transition from one neighbourhood to the next is staged. 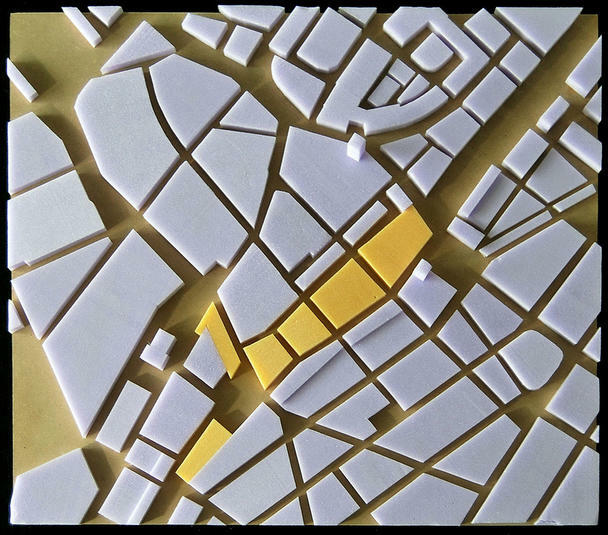 This separation affects the extent of identity for the neighbourhoods, as the heterogeneity of the districts is enhanced by defining its borders. 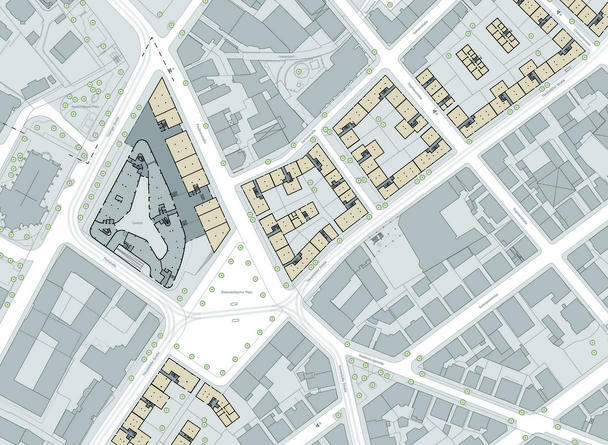 As an example of the concept of urban densification, the area around the „Österreichischer Platz“ is a subject of the urban design. 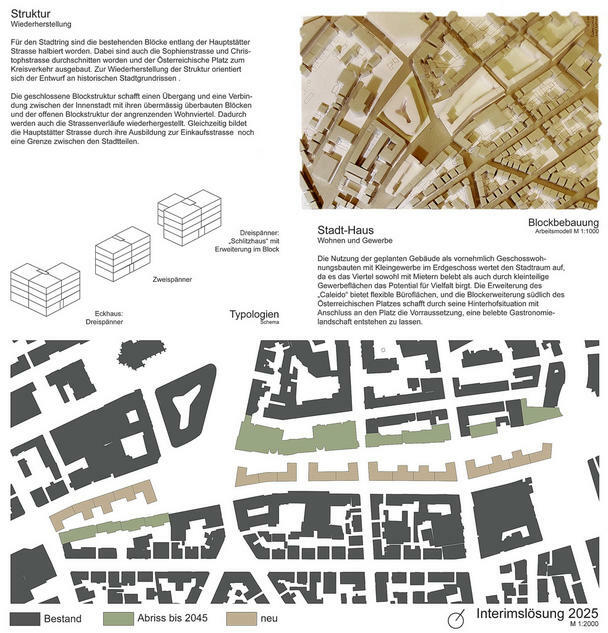 The aim is to restore the city by using the density and fragmentation of existing and proven qualities of Stuttgart. The human being should be put back in the focus of planning considerations. 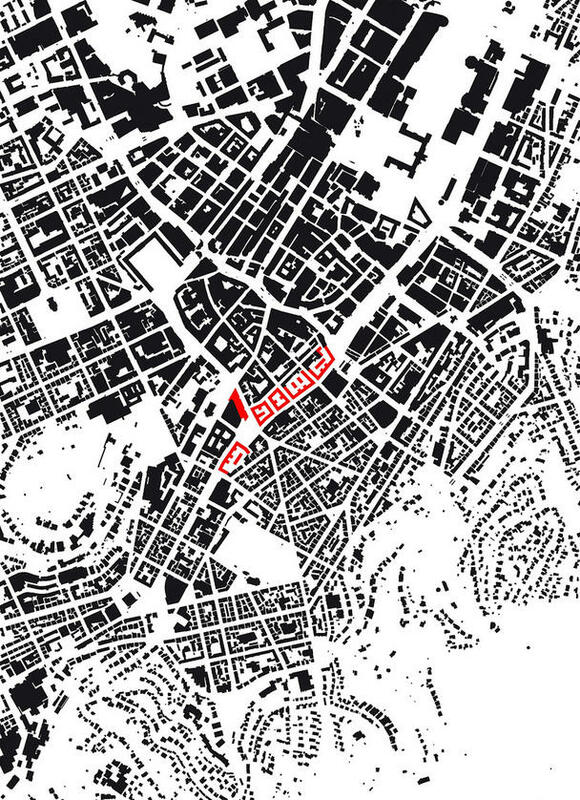 For the re-compaction, the draft uses the block structures of the historic town layout. This means above all to restore the urban structure, which has been interrupted by the City Ring. For the existing City Ring blocks along the road have been cut in half at the Hauptstätter Strasse. Also, the Sophienstrasse and Christopherstrasse were disconnected and the Österreichischer Platz became a traffic roundabout. To restore the structure, the design is based on historical plans. 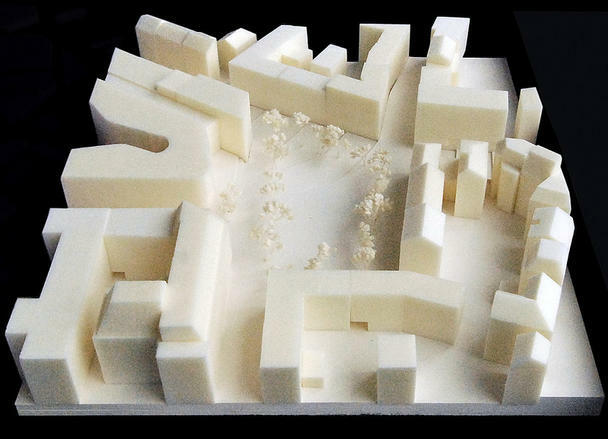 The closed block structure recreates the transition and connection between the city centre and the block structure of the adjacent residential neighbourhood. As a result, the road courses are restored. At the same time the Hauptstätter Strasse as a shopping street works both as a border between districts as well as a connection. To increase urban qualities, the use of the planned multi-storey buildings with primarily small businesses on the ground floor and apartments allow for diversity. 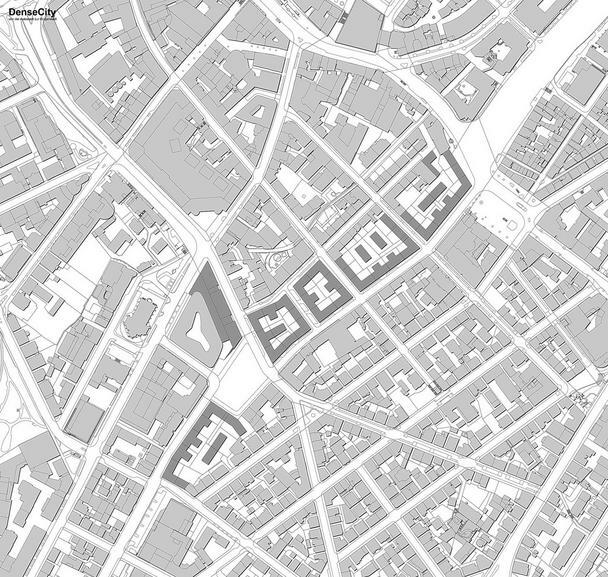 The extension of the "Caleido" offers flexible office space, and the extension block south of the Österreichischer Platz creates space in it’s his backyard that could become a gastronomy landscape.